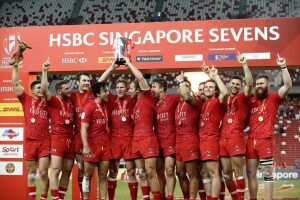 Canada won the HSBC World Rugby Sevens series tournament by defeating USA 26-19 in a competitive final played in Singapore. The Canadians raced ahead into a 19-0 lead but USA scored twice through Perry Baker in a thrilling finale. 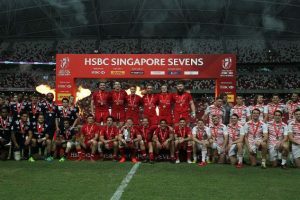 USA ran out in a tournament final for the first time since they won the HSBC London Sevens in 2015 and while Canada played in the Glasgow Sevens final in 2014 they hadn’t featured in one since and never claimed a series tournament win. The match swayed back and forth until Lucas Hammond seized an opportunity to go through the American defence to score and the Canadians hung on to claim the top prize on the night. The game kicked off with a quick try from Canada’s Matt Mullins and while USA were processing that, the Canadians struck again through Harry Jones to make it 12-0. USA pushed up the field but a break saw Mike Fuailefau touch down after a kick ahead, and the Canadians were suddenly 19-0 ahead. Safe to say, USA were not expecting that. But it wasn’t long before speedster Perry Baker turned on the after-burners and one try followed by another from Stephen Tomasin made it 19-12 at half time; game on. The bronze was won by England after defeating Australia 14-12. And the Challenge Trophy was won by Wales which defeated Scotland 24-12. Editorial Note: The article is an edited form.